As most email service providers include anti spam mechanisms in their products, is an additional anti spam solution necessary? You might not think so; but, in a March 2016 test, AV Comparatives – an independent tester of antivirus software – sent 127,800 spam emails to accounts held with consumer email service providers and discovered spam detection rates as low as 89.87% (Microsoft Outlook). The independent tester acknowledged businesses typically use enterprise email services that are more functional than consumer email services, but a similar test on popular Internet security products also produced disturbingly low spam detection rates – Avast 96.71, Lavasoft 94.71% and Symantec 93.63%. When Outlook´s spam-filtering feature was disabled, McAfee scored lower than Outlook itself! What this shows is, not only might businesses need an additional anti spam solution, but the solution has to be effective. Even the best performing anti spam solution mentioned above (Avast) allowed more than 4,000 spam emails to pass through its filters undetected in the test. By comparison, SpamTitan – with its verified spam detection rate of 99.97% – would only fail to detect 38 spam emails. Why is SpamTitan Such an Effective Anti Spam Solution? SpamTitan uses a similar combination of spam detection mechanisms as many other anti spam solutions, but with the addition of a process known as “greylisting”. In the greylisting process every inbound email – with the exception of those from whitelisted senders – are returned to the originating mail server with a request for the email to be resent. 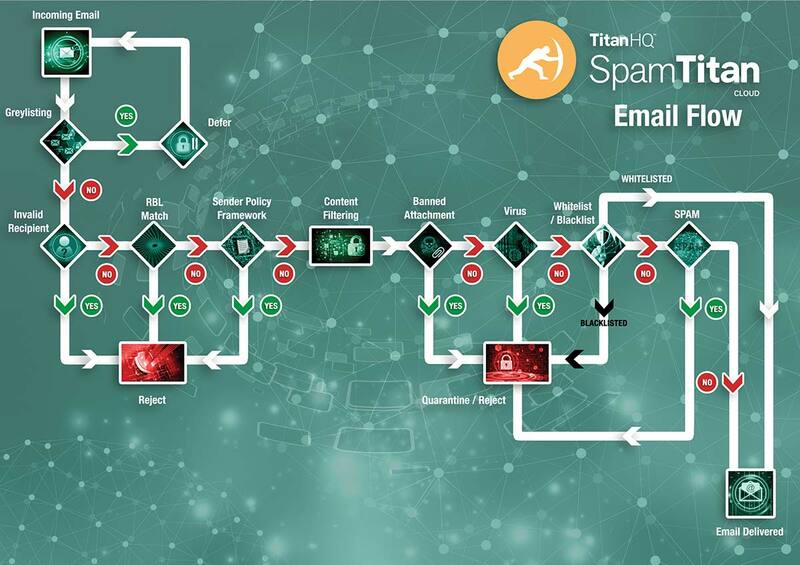 Usually, the mail server receiving the “resend” request will comply with the request within seconds, at which point SpamTitan´s anti spam solution continues its email filtering process. Only mail servers that are too busy to respond – typically those being operated by spammers – fail to respond to the “resend” request, and the spam email is never returned. It has been widely acknowledged that spam email is becoming increasingly sophisticated and, as part of their sophistication, spammers frequently change IP addresses The greylisting process identifies emails from IP addresses that have not yet been included on a Real Time Blacklist or SURBL filter and helps to make SpamTitan a more effective anti spam solution than many other solutions on the market. One other feature of SpamTitan´s anti spam solution not always present in other email filtering solutions is outbound scanning. This feature identifies any attempts by cybercriminals to compromise business email accounts in order to use them for internal phishing or Business Email Compromise attacks, or to send malware-infected spam to the business´s contacts from a “trusted” source. Outbound scanning also identifies any malware being inadvertently sent from a business email account. This can occur if, for example, an employee has been working on a file from his or her malware-infected home computer, and introduces an infection into the network via a mobile device or USB flash drive. The quick identification of the infection can prevent it spreading throughout the rest of the network. The quick identification of a compromised account or outgoing virus can help prevent a business´s IP address being blacklisted by a global blacklisting agency. Being blacklisted might not only affect a business´s communication channels, but also its website – which could potentially be identified as unsafe by web filters, resulting in a potential loss of web traffic, revenue and credibility. Despite the features that make SpamTitan so effective at detecting spam, one of the most-commented characteristics of our anti spam solution is its ease of use. SpamTitan can be deployed either as an on-premises “Gateway” solution or via the cloud. Once deployed, the administration of the solution is managed via a centralized web-based portal, through which administrators can apply acceptable spam thresholds by individual user, by group or business-wide with the click of a mouse. Via the management portal, administrators can also choose which recipient verification types they want to apply, and add Sender Policy Frameworks and web authentication settings if necessary. We recommend quarantine reports are scheduled frequently at first in order to adjust acceptable spam thresholds as necessary, whitelist senders of business-critical emails, and address how quarantined emails should be handled to best comply with user policies. SpamTitan is one of the most effective anti spam solutions on the market. It´s greylisting function help SpamTitan achieve a spam capture rate of 99.97%. Outbound scanning helps businesses identify threats to their IP reputations. SpamTitan comes in a choice of deployment options – software-based or cloud-based. Network administrators can apply email filtering policies by user, user-group, or business-wide. Acceptable spam thresholds can be adjusted with the click of a mouse via the management portal. To find out more about SpamTitan, or to request a free trial of our anti spam solution, do not hesitate to contact us. Our team of Sales Technicians will be happy to answer any questions you have, help you determine which deployment option is best for your particular circumstances and guide you through the process of implementing and configuring our anti spam solution quickly and easily. Contact us today, and you could be detecting 99.97% of spam emails within twenty minutes.